Vibrant fuchsia pink and gold small heart earrings from our Kyoto Garden Collection finished with sparkling pink Swarovski crystals . Handmade in the UK. Kyoto Garden is where exotic birds and butterflies fly among blossom laden branches. The gold highlights in the print evocative of delicate Satsuma vases. 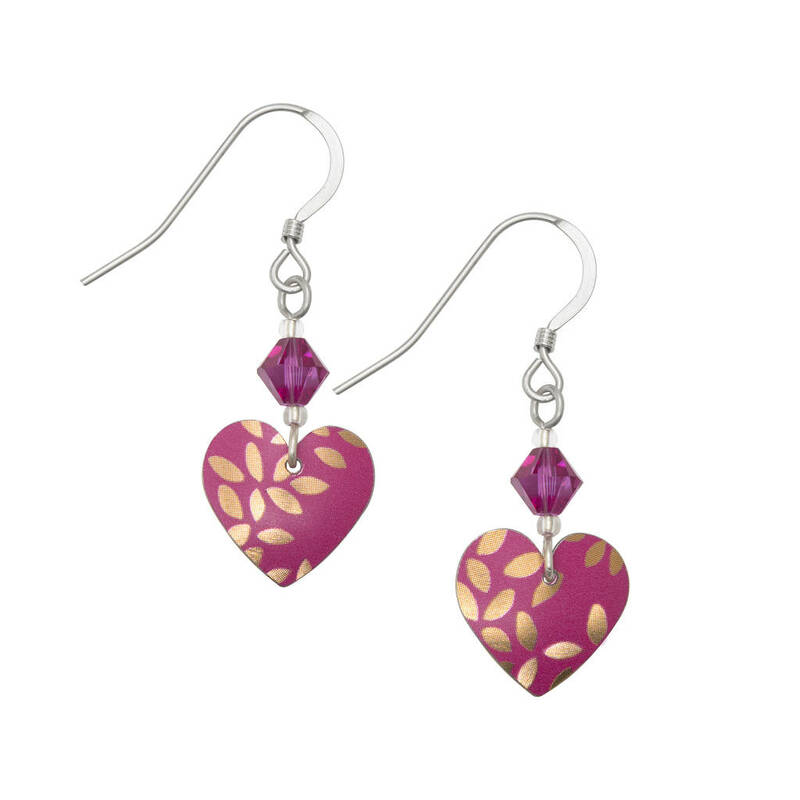 In bright magenta with highlights of gold the earrings are perfect fto add a pop of colour to your Spring Summer wardrobe: great worn with neutrals or constrating brights. Each piece unique. A perfect keepsake gift for a birthday or 10th anniversary and Mother's Day gifting. Showcasing beautiful workmanship our jewellery is cut, domed and finished by hand in our studio in Wales. On short sterling silver earwires. The Kyoto Garden Collection comprises of a range of pendant necklaces and earrings in Blue/Black, Fuchsia Pink and Green Jade with highlights of gold, pink and white. Most of the range are in heart shapes and we also have a rectangle pendant finished with a sparkling crystal. Made from upcycled tin on a sterling silver earwires. We use colourful printed biscuit tins, tea caddies, sweet and toffee tins in our designs. Friends and family give us lots of them, especially after Christmas, UK manufacturers donate their damaged tins to us and we buy more from antique shops and auction sites. When you place your order from us the jobsheet is taken through to the workshop and given to one of our 4 jewellery makers who will use a punch and die to carefully cut the heart from the tin. The piece is carefully sanded with a fine textured emery block and a small drill is used to make the hole for the earwire. After this process the piece is assembled by another maker who adds the sterling earwires and any crystals or pearls that are needed to complete the earrings. Finally they is carefully checked, wrapped and posted . Every piece of jewellery is as unique and individual as the person that will receive it. Please take care of your jewellery by polishing silver with a silver cloth and keeping tin away from water.